They still exist, honest people! A fellow found this Rolex Deepsea Sea-Dweller when he was visiting Amsterdam last Saturday. He had the watch checked by a jeweler to see whether it was a genuine Rolex. It is. If you can proof it is yours, showing your Rolex documentation (warranty card, with the serial number on it) you can get it back from this guy. So, if you are the guy who lost his Rolex, it is only an e-mail away. 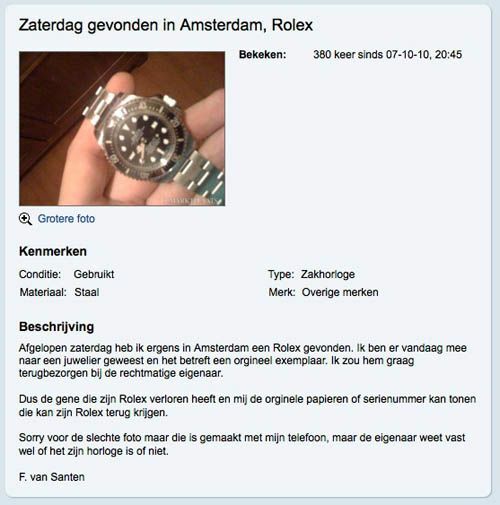 Kudos to the honest finder of the watch for bringing it under the attention on the no.1 Dutch website, marktplaats.nl (lost & found section). Thanks to MaPaLu @ RolexForum.nl for the notification.